I'm sure you've already heard, but I believe there's a wee sport thing taking place this summer over in Russia. While football and reading may not be an obvious pairing, I've always held a place in my heart for both. So when my librarian friend George Kirk asked if I'd record a video recommending a few of my favourite football books I jumped at the chance. 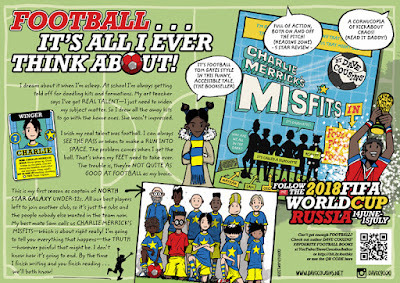 We're hoping that some of the football fans at George's school will be inspired to pick up a book to fill the gaps between matches! Anyway, I thought it was such a good idea, I decided to post the video in case anybody else found it useful. Watch it below or on my YouTube channel here. 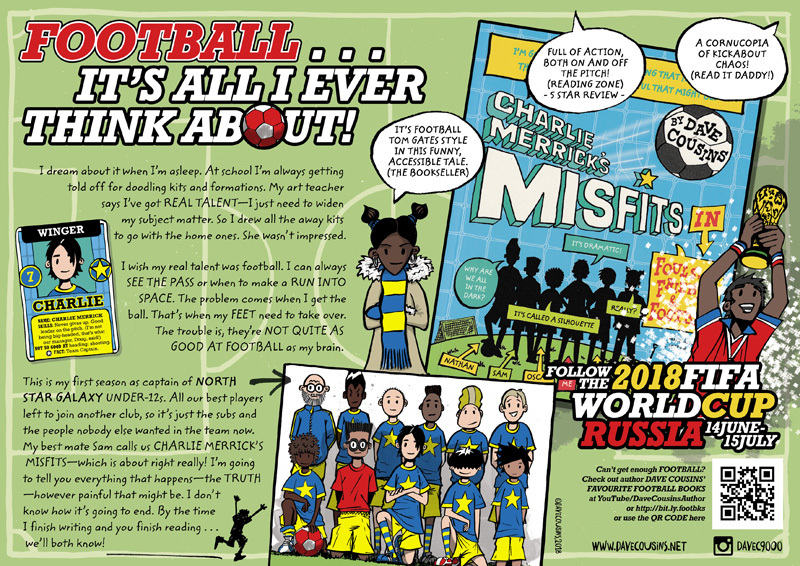 On a similar theme, I finally found some time to make a Charlie Merrick's Misfits poster (see above) to add to my library display set. A3 and A4 sized posters in jpeg format can be downloaded here. 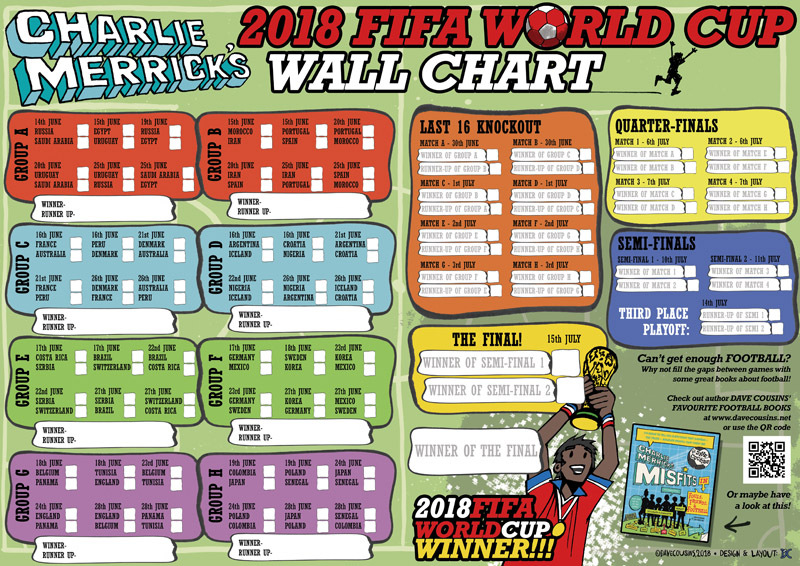 The Charlie Merrick 2018 WORLD CUP WALLCHART (above) is now also ready for download. 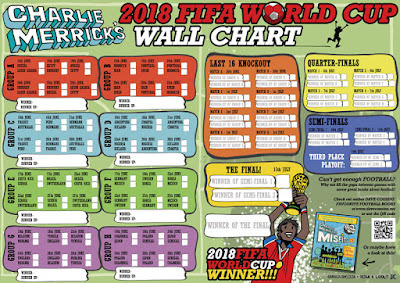 The OUP Charlie Merrick Activity Pack, including design your own squad cards, comics and match sheet templates. Finally my step-by-step guide to drawing a football action scene from the Guardian Children's Books website. These and a few more links are also available via my website. Thanks as always for your support. Have a great summer and enjoy the football! I'm sure you're being bombarded with GDPR emails at the moment, so apologies for adding to the deluge. With that in mind, I'll keep this short. First of all, thanks for originally signing up to receive these occasional ramblings – I hope they have been of interest. If you'd like them to stop, please click the Unsubscribe link at the end of this email. If you're happy to carry on, you don't need to do anything. OK, so now the GDPR bit . . . Here's a link to Google's GDPR statement, if you'd like to read it. The bottom line is that I appreciate your support and would never pass on your information. I will continue to take reasonable measures to protect any personal data provided to me. I hope that puts your mind at rest (if you were worried in the first place!). Hi folks! If you're anywhere near Cambridge this weekend and feel like a FREE book festival, why not drop by Linton Children's Book Festival? 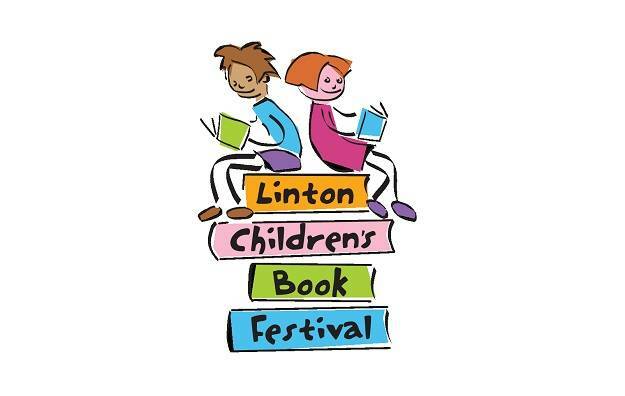 Linton Village College is hosting a full weekend of events with some fantastic authors, poets and illustrators giving talks and workshops. Did I mention it was FREE!? I'll be there on Sunday, running a couple of drawing and writing workshops. For further details of the full line up and booking info, click here. Can it really be that time again? The ice on my keyboard and loss of feeling in my fingers would suggest so! 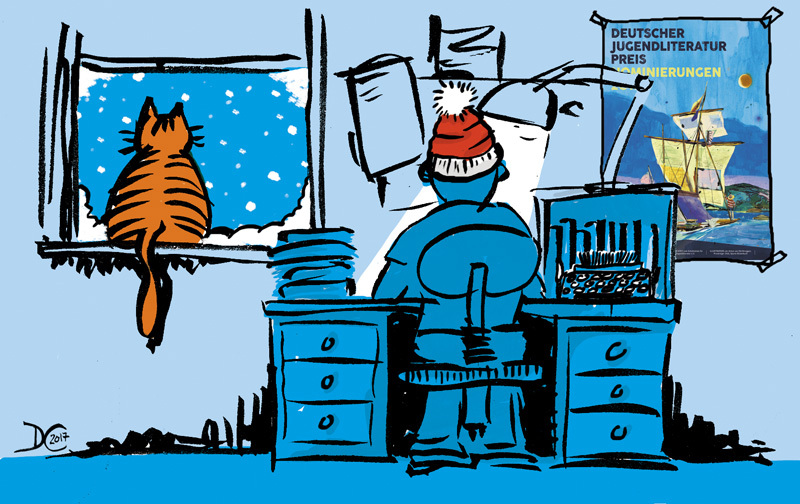 Even the cat thinks that winter is best viewed from this side of the glass. I'm sure you have much to do, so this is just a brief note to offer my compliments of the season and express thanks for your support once again this year. 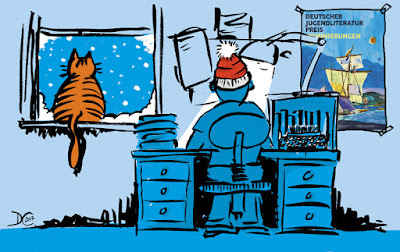 If you'd like to read my full Christmas newsletter, please Click here. A Thank You . . . Some time ago I wrote a story called 15 Days without a Head. It was about two brothers and a single mum struggling to keep their family together. I never dreamed it would ever be published—but it was. When I saw that first copy of 15 Days on a shelf in a bookshop . . . well, I didn’t think things could get much better than that! Last Wednesday evening my wife and I went along to our lad’s school. He was performing a short play, based on a book adaptation, as part of his A-level Drama exam. It was a piece he and his group had written, staged and directed, and would be acting in themselves. I’ll admit—as we took our seats and waited for the play to start, I was a little nervous—I knew how much this meant to our lad, how many hours of work his group had put into it. Finally, the lights dimmed and the actors took the stage. They began, and there was something strangely familiar about the opening lines . . . the names of the characters . . .
Oh, yes they have . . . It has to be one of the most surreal experiences I’ve ever had—seeing the characters from 15 Days without a Head come alive right before my eyes! It took a few moments for the shock to pass, but once I’d reconnected my jaw and started breathing again, I got drawn back into the action. What I saw was familiar, but also not. The characters on stage were doing what characters should do—they were taking control of the story, telling it their way. The book was there, but this was better, sharper, leaner. There was Laurence towering over them all, doing his best to keep it together, fighting a losing battle against circumstances, frustration and fear. There was Mum, the anger and bitterness flying from her lips as she slammed around the stage, before slipping seamlessly into another character—local radio DJ Baz, all corny catchphrases and slick delivery. I noticed the quiz questions were new though—chilling statistics about children in care—so much more powerful than what was in the book! 15 Days without a Head is a tough tale to tell—it took me years and two hundred plus pages to get it down! This group had done it in two months, and created a thirty minute play that had the audience rapt. At the end, when Mum is (literally) surrounded by her demons—drink, self-loathing, desperation and anger—while her two boys fight to get her back with nothing more than their simple, heart-breaking offer of love—like most of the audience, I was fighting back tears. Re-running it in my head now, there are so many moments that keep coming back to me—great bits of physical theatre like Jay on the swing made from two other cast members' arms; the brothers cleaning their teeth in a human mirror; the comic relief of the telephone box with its living, speaking adverts—“Call Cheryl for a real good time!”; Baz and his radio crew; Mina and Laurence in the library . . . When 15 Days without a Head was published it was literally a dream come true for me, and I appreciate all the incredible experiences and opportunities I’ve had over the years as a result of writing books. But, I have to say—the events of last Wednesday evening will take some beating. It was a very special moment, and one that I will never forget. So, I’d like to take this opportunity to thank the talented cast and writers. Ashlea, Kym, Lewis, Sarah, and Dylan—you were brilliant. Huge respect and thanks to you all. Gonzo shortlisted for German Children's Literature Award! I don’t normally shout about this kind of stuff, but I’m really chuffed about this one and wanted to share the news! 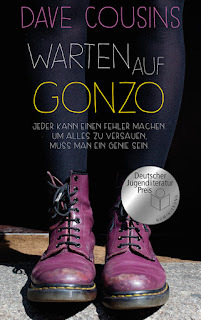 The German edition of Waiting for Gonzo, Warten auf Gonzo, has been nominated for this year’s Deutscher Jugendliteraturpreis in the Young Adult category. 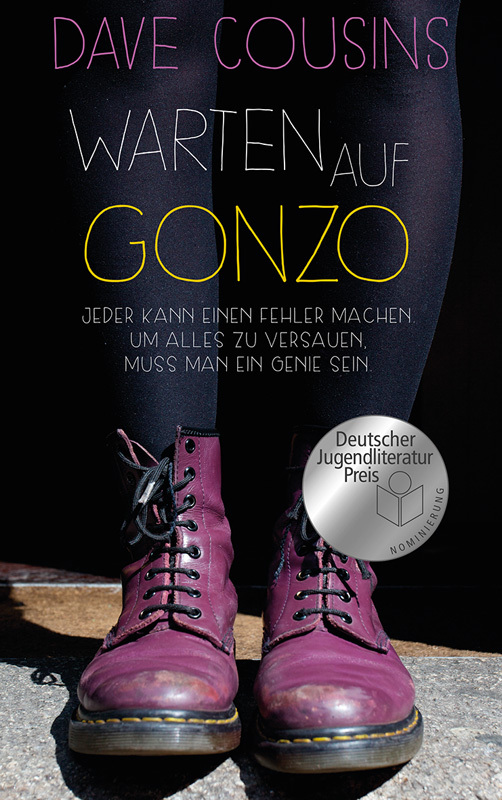 Gonzo is one of six books on the shortlist announced at the Leipzig Book Fair last week (see photo!). The Deutscher Jugendliteraturpreis/German Children’s Literature Award is the most prestigious award for children’s and young adult literature in Germany, so it’s a real honour to be included. The results will be announced on October 13, 2017 during the Frankfurt Book Fair, with the Federal Minister Manuela Schwesig presenting awards to the winners in each of the five categories. 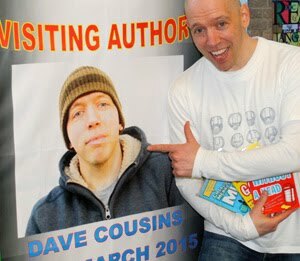 Waiting for Gonzo was the second book I had published in the UK. I was warned that second books are notoriously difficult to write, and Gonzo duly proved the rule! It is also the book of which I’m most proud, partly because of the blood, sweat and tears shed in order to get it right! I’m always extra pleased when readers tell me they enjoyed it, and despite the many drafts, long hours, and sleepless nights, in the end I had a lot of fun with Gonzo. In 2013 I was lucky enough to fulfil one of my dreams when I was invited to the BBC studios in Bath to narrate the audiobook. Somehow, I then ended up going into a different ‘studio’ with one of my old bandmates to record a full soundtrack album to accompany the book—ten tracks of original songs by four of Oz’s favourite bands. Which, of course, needed music videos to go with them. Lots more work, but again, good fun. There are lots of different language editions of Waiting for Gonzo out now, and I’d like to thank my publishers across the world for introducing Oz and the gang to so many new readers. But of all the editions, I have to say that my German publisher, Verlag Freies Geistesleben produced an exceptionally beautiful one. The cover, featuring Meg in her Dr. Marten boots, captures the mood of the book perfectly. The typography and page layout is wonderfully subtle and gives the whole edition a lovely feel. There’s even a QR code on the jacket linking to the aforementioned soundtrack. Superb stuff. Sadly, my sub O-level German isn’t anywhere near good enough for me to read this edition (though I am trying to learn in preparation for my trip to Frankfurt!). But I’d like to take the opportunity to thank Anne Brauner for translating this and the German edition of 15 Days without a Head. Judging by the nomination, I’d say she did a pretty good job! P.S. Should you wish to, you can find out more about the Waiting for Gonzo soundtrack here. I hope all's well, and that those of you taking part in the recent World Book Day celebrations had a good one. I'm almost at the end of my current WBD 'tour', so a big shout out to everyone I met over the past couple of weeks—you guys ROCK! This is just a quick post to tell you about a public event I'm taking part in this weekend. If you live anywhere hear Newcastle, and feel like some book-based fun on Saturday, why not come along to the GOSFORTH COMMUNITY BOOK FESTIVAL! There will be some great authors appearing, including Andy Briggs, Chris Callaghan, Tom Palmer, Hannah Russell, Holly Sterling, and me! As well as the author events, there will be activities throughout the day—arts and crafts, creative writing, plus the chance to purchase books from the Seven Stories Book Shop and get them signed by the authors. I did hear rumours of tea and cake too . . . The festival is at Newcastle School for Boys, The Grove, Gosforth, Newcastle upon Tyne, NE3 1NH on Saturday 18th March, and runs from 10am to 3pm, with talks staggered throughout the day. Entry is FREE! Waiting for Gonzo – a Book with a Soundtrack! An index … of sorts! 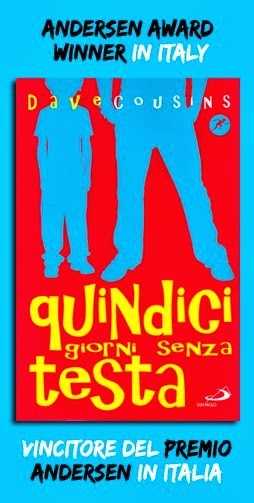 Scribbler of books—"teen realism with action, humour and heart". 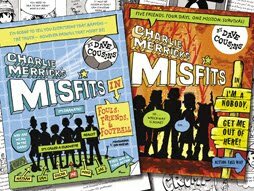 Also the author/illustrator of the Charlie Merrick's Misfits series. Published in over twelve languages, 15 Days without a Head was a Sunday Times Children's Book of the Week, and has won awards in both the UK and Europe. 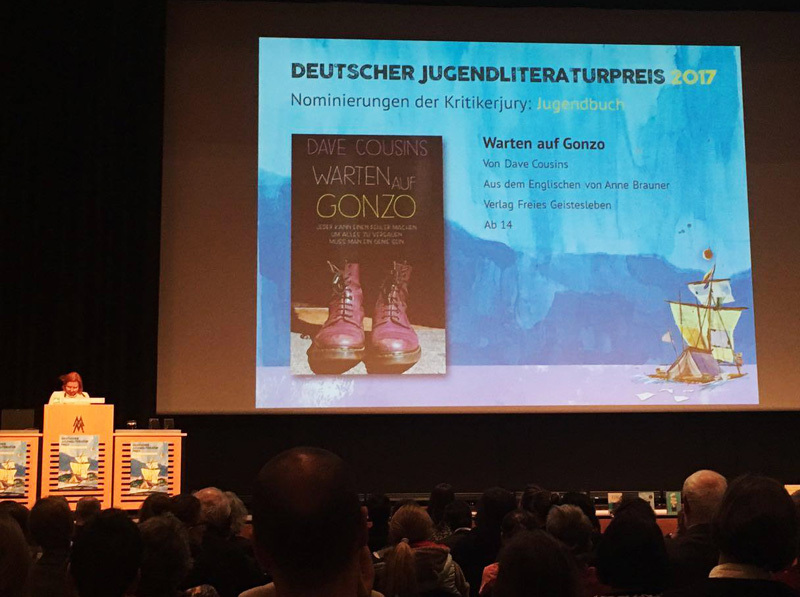 Waiting for Gonzo won the Grampian Children's Book Award and has been shortlisted for the 2017 Deutscher Jugendliteraturpreis. Member of SCBWI, SOA, NAWE and author collective The Edge.